As some of you know, Python has been making its way into the calculator market. So much so that HP, Casio, and NumWorks all have some kind of on-calculator Python interpreter built in! For some reason, TI didn't get with the program, so to speak, and instead released an external module for the TI-83 Premium CE that allows it to run programs written in Python. As you can imagine, carrying around a bulky module isn't very efficient or fun. In fact, it disqualifies the TI-83 Premium CE from many standardized tests because they don't allow anything to be plugged into the USB port. To combat this, people have even tried to stuff the module's circuit board (without the case) into the calculator chassis! Julien (Translated): Indeed, just before the next fall, a new version of the TI-83 Premium CE containing Python will be available in stores. If you do not have the calculator yet, we advise you to wait for the news. Although it's unclear how exactly TI will build-in Python to the TI-83 Premium CE Python Edition (there's a guessing poll on TI Planet), we do know that it will not be reliant on an external module which will allow it to be used on tests and it will be a lot more convenient, though most likely still not nearly as fast as competing calculators). We finally definitive evidence of the new calculator, and an official picture of the TI 83 Premium CE Edition Python! Some of you may have noticed that the name doesn't quite match up with the video TI published, I believe we think that's the video narrator's error. I know we all want to know when will this be available and how much will it cost? 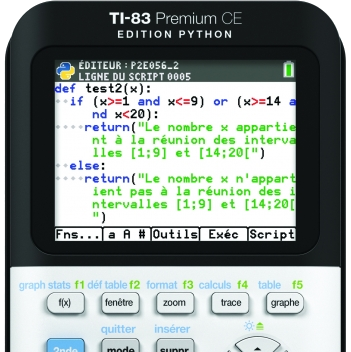 Today, promotion shop TS (name may have been botch through my translator) confirmed that the TI-83 Premium CE Edition Python will be available in the fall of 2019, right during the rush when students and parents are looking for a calculator to buy for the upcoming school year. Fortunately, the price won't be changing at all! It will stay at 80 Euro which is about 90 USD! Sadly, it will not be sold in the USA so if you are considering buying it, you will want to consider high shipping costs! So what are your thoughts about this calculator? How do you think TI will build-in Python support? Do you think the USA will ever get a TI 84 Plus CE Python Edition? © Copyright 2000-2019 Cemetech & Christopher Mitchell :: Page Execution Time: 0.128408 seconds.